Over the last 30 years, the church in America has been engaged in a critical conversation about the best way to “do” church. Of late, the conversation de jour seems to be the “attractional vs. missional” debate – whether the church should focus its attention primarily inside the walls or outside the walls of the church (or perhaps whether the church should have walls at all). AND: The Gathered and Scattered Church is a much-needed addition to that conversation. I have weighed in heavily to the debate myself – with a strong missional bias. Because of the ways that God has uniquely gifted and wired me, my ministry has always been focused on sending people to engage the culture as missionaries, rather attracting more people to come to programs at the church. As pastors of Adullam, a “congregational network of incarnational communities,” Hugh Halter and Matt Smay share my bent towards a missional/incarnational approach to church (the “scattered” church), but also make the point that “gathering” is inherent in the definition of the word we translate as “church” – ecclesia (“the assembled ones”). 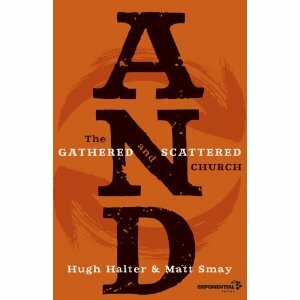 Halter and Smay, who previously told the story of their congregation in The Tangible Kingdom, penned AND as a call to “stop bickering over macro vs. micro, incarnational vs. attractional church.” They make the point that “what brings meaning to your gathering is how well you scatter” and encourage churches to see gathering and scattering as both essential. I’ve heard Mark Driscoll say that the church gathers for worship AND scatters for witness. Both the gathering and the scattering are necessary and, as Halter and Smay point out, emphasizing one at the expense of the other is like trying to reach the world with half a church. Instead, the purpose for our gathering for worship should be to push us beyond the walls for witness. Both missional AND attractional church leaders can learn from AND!